I'm writing to you because now there's even more to the Big BUT System. In case you missed the previous send-out, the Big BUT System is the blocking of negative information about Islam with a BUT. However, it soon became apparent that the majority of people respond to everything negative about Islam with a BUT. - BUT Islam is only 1400 years old; think of Christianity 600 years ago. - BUT think of the Crusades. - BUT there's good and bad in all religions. - BUT that's hate speech. - BUT it's all a matter of interpretation. - BUT I know a nice Muslim. The longer I looked, the more BUTs I found. More important, though, is for us to recognize that we're up against a system - something unnatural, constructed. 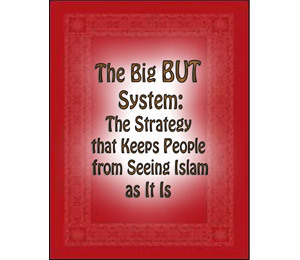 The goals of the Big BUT System: to give great answers to the individual BUTs, and also to make the system visible, instead of letting it operate in stealth, another form of stealth jihad. Excellent logic, but wow what a battle it all is. By the way, most of us BUT lots of things away - for instance, "I'd love to do that, BUT . . ." The difference with the Big BUT System is that, the more you explore it, the more you see it's unnatural. The portmanteau fallacy 'Islamophobia' is self-refuting. Since 'Islam' (the first part) is a political ideology, it doesn't fit with 'phobia'. One cannot ban or prosecute a mental illness! Will arachnophobia be banned next? Furthermore, criticism of a political ideology (Islam) is political science, not psychiatry, and it cannot be considered as hatred directed towards or fear of a person to criticize a political ideology.